The new DA found out on Friday (September 21) that the bones that had been buried underneath Charlie's pub belong to her dad. Spoiler alerts indicate that things are about to heat up on "General Hospital." When Margaux arrived in Port Charles, she seemed to be just another DA trying to make a name for herself by trying to prosecute Sonny. On Thursday (September 20), it was revealed that the remains which were buried beneath Julian's pub belonged to Joe Scully's attorney. 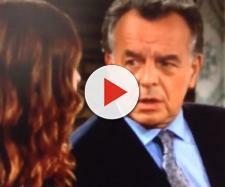 On Friday (September 21), as Jordan was talking to Sonny, Ms. Dawson blurted out that the dead man was her father. She should be removed from the case because of the obvious conflict of interest but Soaps She Knows reports that the new DA will have a theory this week and Celeb Dirty Laundry states she will be out for blood and seek to put Sonny behind bars. Spoilers don't say what the theory is that Margaux will come up with, but she is sharp and may figure out the truth. Sonny was an 18-year-old kid, trying to "make his bones" in the mob world, and shot a man he did not know. His dad, Mike, saw him bury the body, dug it up, and put it in the ground underneath Charlie's pub. Sonny has been saying that the only thing that can link him to the crime is the gun, so it's possible the DA may eventually uncover it. Ms. Dawson seemed truly rattled to find out that the dead body belonged to her father, but spoilers state she will do all she can to solve this mystery in Port Charles. Jordan and Margaux already know that Mike was connected to Charlie, the former owner of the pub, as well as Frank Smith, and other crime lords back in the day. Because of his Alzheimer's diagnosis, the DA and police commissioner realize they cannot rely on his testimony so they will focus on his son. CDL spoilers tease that Ms. Dawson will be like a dog with a bone and not let go until she has a conviction. Even though her father as not around when she was growing up she will want to avenge the fact that his dead body was hidden for 30 years. CDL teases that Margaux may send Sonny to jail, but "GH" viewers realize this may go the other way. Even if DA Dawson finds the smoking gun, she may not be able to outsmart Mr. Corinthos. The Port Charles crime lord has more people in his corner than she realizes. Last week, Jason was talking to someone he has on the inside, who has access to the evidence room. Sam and Jason, together, are excellent detectives, and Spinelli is a top-notch computer hacker. Evidence can disappear and witnesses can be bribed or end up missing without a trace. Whatever theory Soaps She Knows alludes to, be it way off base, or 100 percent correct, Margaux can fail like so many others before her. Even if the DA lands a conviction, Sonny may escape prosecution, or be released early from prison, as has happened in the past. Stay tuned to "General Hospital," weekday afternoons, at 2:00 PM ET on CBS. Be sure to also be on the lookout for additional spoilers related to this intriguing storyline.